SALT LAKE CITY (AP) Dion Waiters struggled with his shot for most of the game. He found his stroke just in time for the Miami Heat. Waiters scored 12 of his 21 points in the fourth quarter, and the Heat rallied to beat the Utah Jazz 84-74 on Friday. Goran Dragic had 18 points for Miami, and Tyler Johnson finished with 11 on an ugly night for each team on the offensive end. Hassan Whiteside had 20 rebounds and blocked three shots. Waiters took over down the stretch, scoring 10 points during a 13-0 run that made it 84-74 with 31.6 seconds remaining. He was 3 for 15 from the field heading into the fourth quarter, but he made four of his five shots in the final period. The Heat (5-6) outscored the Jazz 20-8 in the third quarter after trailing by 12 at halftime. 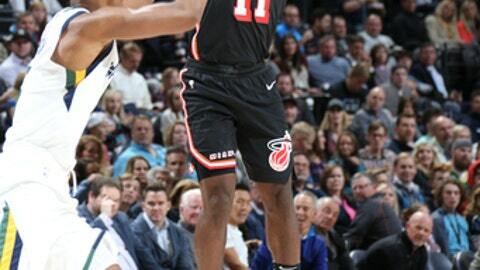 Miami put together runs of 11-0 and 7-0 during the period, and the Jazz had just one field goal in the 12 minutes. Utah was held to 25 second-half points in its lowest scoring game of the season. It was 1 for 18 in the third and made just four field goals in the second half. The Jazz (5-6) have dropped four in a row. ”There were a lot of open looks that we didn’t make,” Jazz coach Quin Snyder said. ”Whether it’s confidence, or continuity or connectivity or whatever the case is, we’ve just got to grind through it. There isn’t a magic bullet right now. Jazz center Rudy Gobert went down late in the third quarter with a right knee contusion after a Heat defender fell into his legs. He returned to start the fourth quarter and finished with 12 points and 12 rebounds. Rookie Donovan Mitchell started in place of Rodney Hood as the Jazz searched for more offense. Hood responded with 19 points and Mitchell had 12. ”I feel like we played way better offensively than we did against the Sixers (on Tuesday),” Gobert said. ”We just didn’t hit shots. Had a few turnovers, at times. Heat: Miami shot just 15.8 percent from the field in the second quarter. Jazz: Joe Johnson will be evaluated in a couple days after missing the last five games with wrist tendon instability. In Miami, the Heat celebrated their Veteran’s Day tradition by helping repair and rebuild the homes of two former U.S. soldiers in need. The two homes that the Heat group – including Alonzo Mourning and Glen Rice – worked on Friday were both damaged by Hurricane Irma. The Heat provided things like roof repairs, appliances, painting and landscaping. In addition, Heat President Pat Riley and his wife Chris donated $25,000 to both soldiers. Mitchell for Hood in the starting lineup was the first major change Snyder has made this season. The Jazz continue to search for the right rotations at the right moments as they learn to play without Gordon Hayward and George Hill. The losses of Dante Exum (shoulder) and Joe Johnson haven’t helped the process. Heat: Travel to face Andre Drummond and the surging Detroit Pistons on Sunday. Jazz: Host D’Angelo Russell and the Brooklyn Nets on Saturday.